From simple applications to multi-load/multi-temperature systems, learn how to use the newest and most sophisticated hydronic heating materials and methods without sacrificing comfort or energy. 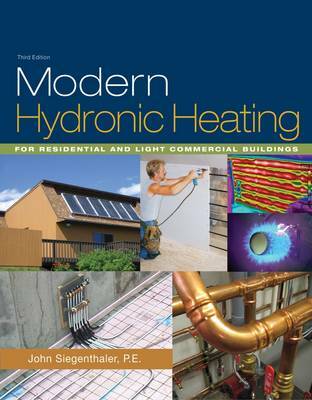 Heavily illustrated with product shots from top manufacturers, plus more than 300 diagrams of system piping/control schematics, MODERN HYDRONIC HEATING, 3rd EDITION is a one-of-a-kind introduction to today's hydronic heating systems. It transforms engineering-level design information into practical tools that can be used by technical students and professional contractors alike. This revised edition features the latest information on state-of-the-art techniques for use in residential and light commercial buildings, such as radiant panel heating, injection mixing, primary and secondary piping, the use of buffer tanks to improve system stability, and advanced control methods. From students new to the industry to basic installers to design engineers, everyone involved in the heating trades will benefit from this preeminent resource of the North American hydronic heating industry, which is as well-suited for use in a formal education course or for self-study as it is on the job.